If you haven't already done so, take with you to the consultation your medical history, family medical history, and a record of drugs and supplements you use or have recently used. It's a good idea to ask your spouse or partner or a friend to go to the consultation with you. To select the right type of replacement lens, your doctor will want to know about your work and other responsibilities, your hobbies and interests, and any other activities that are meaningful to you. Be prepared to tell the doctor how you feel about wearing eyeglasses occasionally, often, or all the time, and whether near, mid-range, or distant vision is most important to you. 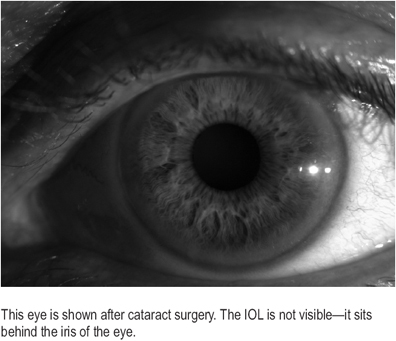 Your eye doctor will probably want your internist or primary-care physician to do a physical examination and lab work within a month or so before your surgery. The purpose is to verify that you are healthy enough to have the surgery, that you're not having unexplained symptoms such as chest pain, and that you haven't had a recent cough, cold, or flu episode. Three days before surgery. Start using the antibiotic eye drops your surgeon has prescribed. If you wear contact lenses, remove the lens from the eye to be treated and leave it out. If you haven't yet done so, arrange for someone to drive you home after surgery. This is important, because you will not be able to drive right after surgery: You'll be a little groggy from the sedative, your pupil will be dilated, and your eye may still be "asleep." The day before surgery. Don't have anything to eat or drink for the eight hours preceding your surgery. You can take necessary medications with a small amount of water. The day of surgery. Don't wear makeup or fragrances, including scented lotions or hair products. Don't take or wear jewelry or other valuables. Do wear comfortable street clothes, including a shirt that buttons up the front. These are the clothes you'll be wearing during surgery, so make sure they're loose, not binding. Do take your medications and insurance card to the surgical center. Do arrive an hour before the scheduled time for surgery. Plan to be at the surgical center for about two and a half hours. 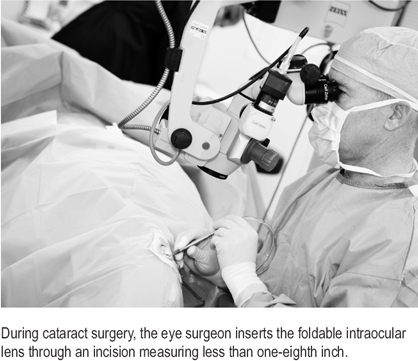 A fully staffed operating room in a certified surgical center is the best environment for cataract surgery. High standards for cleanliness and the presence of a board-certified anesthesiologist can help ensure that there are no complications. Nursing staff will check your blood pressure and insert an intravenous (IV) line, which the anesthesiologist will use to administer a mild sedative. 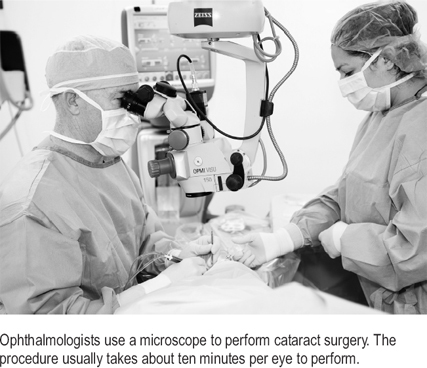 About thirty minutes before the surgery, a nurse will put drops in your eye to numb the area and to dilate the pupil. In the operating room, your eyelid, eyelashes, and face will be cleaned with an antibacterial iodine solution. Your doctor will want to eliminate any possibility of infection. The iodine cleansing is just one of several ways of ensuring that the procedure is completely sanitary. After giving you a sedative through the IV line, the anesthesiologist will place small heart monitors at the top of your chest. (This is why it's recommended that you wear a front-buttoning shirt.) The sedative won't put you to sleep; you'll be awake but relaxed during surgery. You'll lie on your back, completely covered with a special sterile sheet that has an opening over the eye. The rest of your face will be covered to keep bacteria from your nose and mouth away from your eye. A small tube, similar to a drinking straw, will be placed beneath the sheet on your chest. During the time your face is covered, this tube will release a gentle flow of oxygen toward your face. The anesthesiologist will be sitting by your side the entire time, monitoring your vital signs throughout the procedure.